… as told by Cole Coonce to the Elapsed Times. 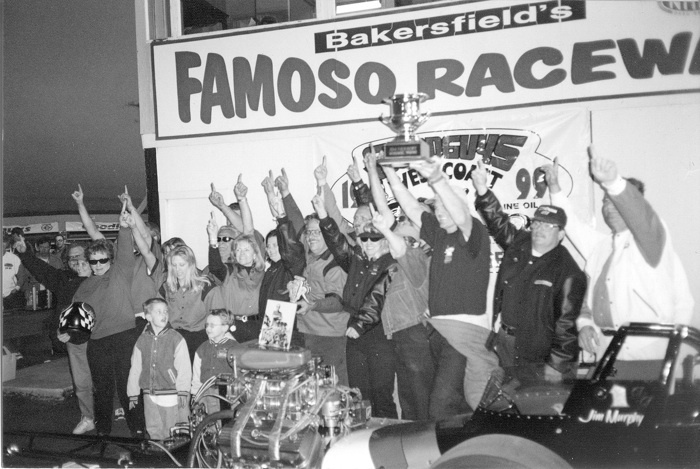 Publisher’s Note: In keeping with this weekend’s motor-riffic machinations at the Bakersfield March Meet, here are some excerpted memories of that event from the pages of Top Fuel Wormhole. Specifically, this is Cole Coonce’s Top Fuel coverage from the 1998 and 1999 events, separated by a brief obituary of epic crew chief, Jim Herbert, who won the 39th March Meet and passed on suddenly days before the 40th, which he won, arguably, posthumously. Goodguys 39th March Meet, Famoso Raceway, March 13-15, 1998—Wam! Bam! Wallakazaam! What a rootin’ tootin’ drag race! And it all boiled down to two dragsters—the venerable awe-inspiring, Jim Murphy-shoed W.W. Two machine against the immaculate fresh-outta’-the-oven Foothill Flyer slingshot (shoed by “Nitro Neil” Bisciglia)—squaring off for all the prestige and glory that is part and parcel of winning Top Fuel Eliminator at the March Meet. The biggest damage to the spectator’s and participant’s sense of reality transpired during the final session of Top Fuel qualifying late Saturday afternoon, when the wheat began to separate from the chaff. Amongst the 21 cars entered, the list of non-qualifiers as of Saturday afternoon would make for a pretty decent hot-rod harvest unto itself: Champion Speed Shop, Fuller & Dunlap, Pure Hell, The Birky Bunch, the Foothill Flyer, W.W. Two, Steiner & Berger and others were all in line to get tickets to Sunday’s dance. More high drama manifested when “Nitro Neil” attempted to qualify the brand new Stirling-chassied Foothill Flyer, which arrived at engine czar Ken Castagnino’s shop at 6 am the previous Monday morning—sans motor. 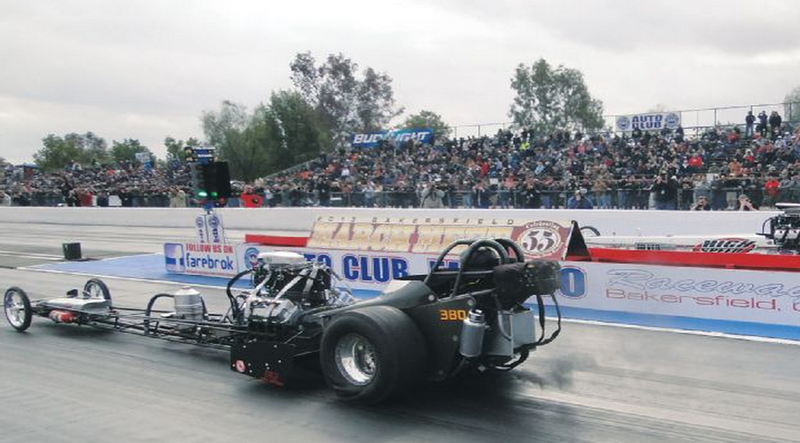 It had been a tumultuous, topsy-turvy week for Neil, car owner Pete Jensen, engine donor Ron “Pro” Welty and the rest of the Foothill Flyer’s “Free Mexican Air Force,” as they thrashed on the dragster for five days, ultimately towing to Bakersfield without having even fired the engine. More than one member of the nitro cognoscenti raised an eyebrow in disbelief as the FMAF worked like an Alabama chain gang to finish prepping the new car, only to smoke the tires during their first two qualifying attempts. All that overtime paid off, however, as Neil silenced the non-believers with an in-the-pocket 6.37 at 224 mph, a clocking which prevailed for 8th and final position on the eliminator ladder. MARCH 3, 1999—It is with great sorrow that I report that Jim Herbert, majordomo of the W.W. Two AA/Fuel Dragster, passed on this morning. Details are still forthcoming, but apparently it was heart related. The timing of his passing is somewhat ironic because his health had been sketchy for years, but he really seemed to be getting healthier lately. I was discussing benchmarks recently with some Internet bleacher bums and some folks mentioned the 6.000 that Ted “the Bad Lieutenant” Taylor recorded in the W.W. Two car as a definitive moment in drag-strip history. We would be remiss to mention that Herbert’s hot rod was the second slingshot in the 5’s. He also tuned his latest driver, Jim Murphy, to that 250 mph moon shot at Famoso. 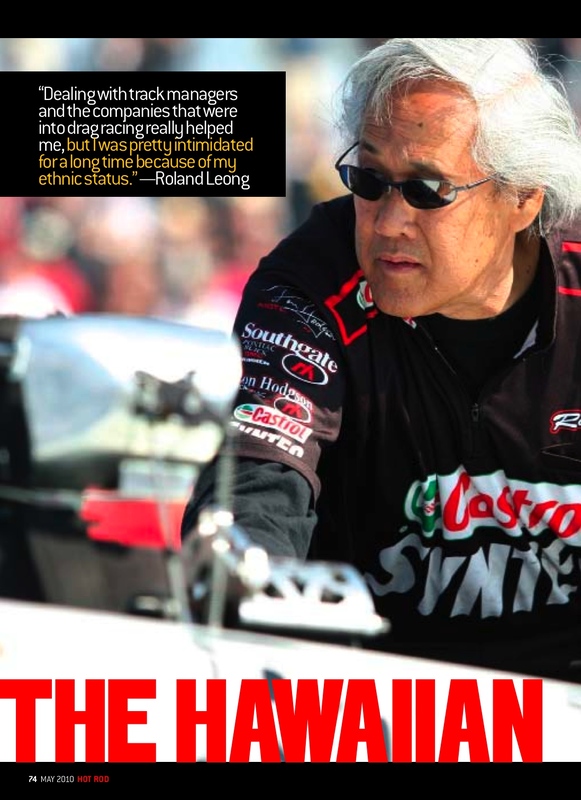 I had the honor of “getting next” to Herbert during the course of my drag strip journalism endeavors—which is to say he would return my phone calls. Straight up, nobody commanded my respect more than this man—and I have had the pleasure of meeting a plethora of both abstract and forward thinkers in a variety of mediums. Herbert, however, had really been in a groove for the last decade or so. It was a real privilege to meet the man as he truly hit his stride. 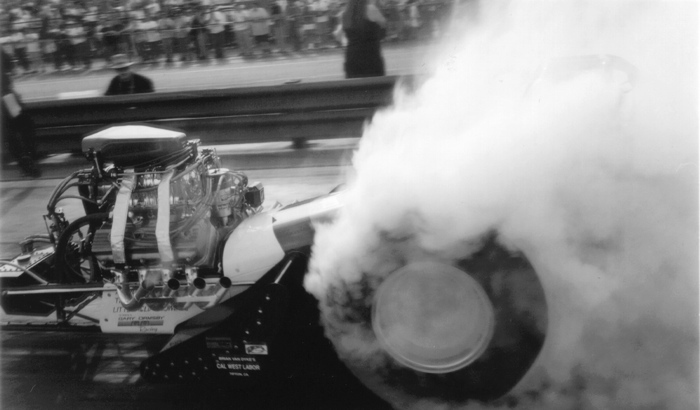 One of the most epic sights in drag racing was watching Herbert snap the ground wire off the mag and WHAPP! WHAPP! WHAPP! the mighty, beastly W.W. Two fueler would awaken with a roar. Herbert would point the driver (Taylor, Gary Ritter, Murphy) into the beams and with these few graceful and economic hand gestures he would let everyone gathered around the starting line know exactly whom they were reckoning with. “Epic.” “Graceful.” Hey! We should all hit our marks with such dignity and panache. Jim, the drag strip community will be poorer without your presence. You were truly a hero, whose penchant for setting racers and race fans on their ear was matched only by your humility and modesty. Facing off against “Wild Bill” Alexander for the honor of Top Fuel Eliminator at the Goodguys March Meet was the W.W. Two AA/Fuel Dragster, the defending champs, who were sans their esteemed point man, Jim “the Lizard” Herbert, who had passed on to the Great Flow Bench in the Sky a mere ten days prior, a victim of a heart aneurysm. Herbert died with the secrets of his tune-up still locked in his noggin. Defense of the March Meet title was left to his surviving teammates (who were ambivalent about campaigning the dragster in Herbert’s absence but were persuaded to go racing by Herbert’s widow, Cheri) and their ability to unlock and decipher the secrets of a complicated matrix of nozzles, weights and measures that comprised the blown-Chrysler-on-nitro tune-up that had been taken to the grave. Befitting of a man of his stature, the winner of Top Fuel Eliminator at the March Meet was also the recipient of the Jim Herbert Memorial Trophy. During qualifying, the chances of driver Jim “Holy Smokes” Murphy and the rest of the W.W. Two team transforming their appearance here into a proper wake seemed remote. 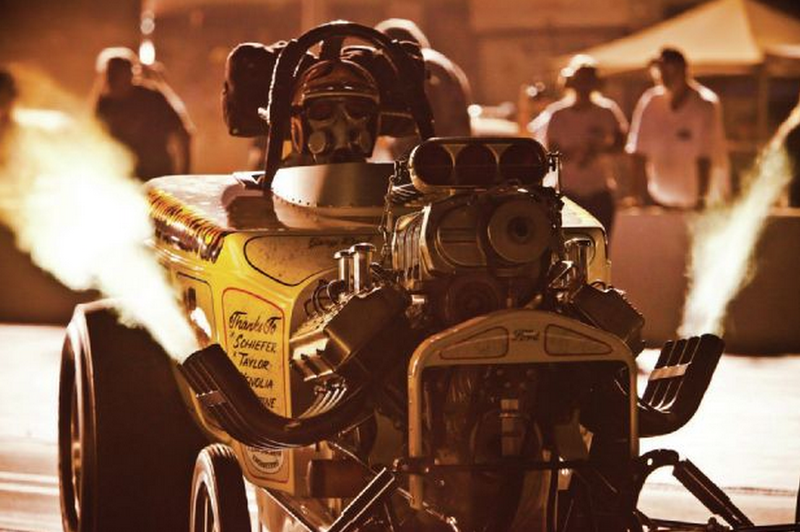 After three qualifying attempts, they anchored the bump spot with an elapsed time of 6.23, far off the pace set by “Swingin’ Sammy” Hale in the Champion Speed Shop/Juxtapoz Chevy-powered fueler, who had rocketed to an unprecedented 5.87 at 232 mph to snare the pole position. On the other side of the ladder, however, Alexander, shoe for Frank “Root Beer” Hedge’s Mastercam team the unenviable #5 position on the elimination ladder and pitted Alexander against “Swingin’ Sammy” Hale. 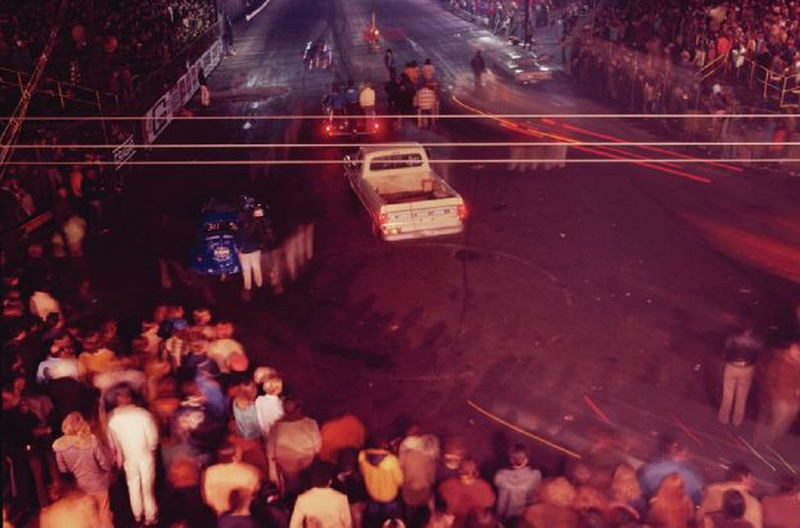 But in eliminations the Champion team made a strategic mistake as the Chevy put out a cylinder or two, lost and regained traction and sashayed to a losing 6.54 against Bill’s superior 6.17 at an impressive 234 mph. Despite an aggressive clutch set-up, fate continued to bless Alexander in the semi-final round of eliminations. His competition, Rick McGee in the Tedford, Hester & McGee entry, appeared en route to an easy victory as the Mastercam machine struck the tires on the launch and limped down the racetrack. At 1000 feet, however, as McGee was all alone ten yards from the end zone, he fumbled, striking the centerline cones and was disqualified. McGee’s transgression left Hedge & Alexander with the uneasy task of playing Snidely Whiplash to the W.W. Two team’s Dudley Dooright. . . Indeed, as Hedge emerged from the undulating clouds of tire smoke en route to his tow vehicle and was informed that he actually had won that heat, he was noticeably shaken and appeared rather distraught. “This is Herbert’s race,” he said, moments before regaining his senses and cranking up both the nitro percentage and the lead on the magneto. Despite any perceived trepidation concerning spoiling a Cinderella story, the Mastercam machine was loaded like an elephant gun in the final round. The motor was as loud, over-the-top and boisterous as it has ever sounded. The burnout was particularly deafening. As “Wild Bill” pulled ‘er into the beams, the blower straps caught on fire due to a leak out of the left header bank. 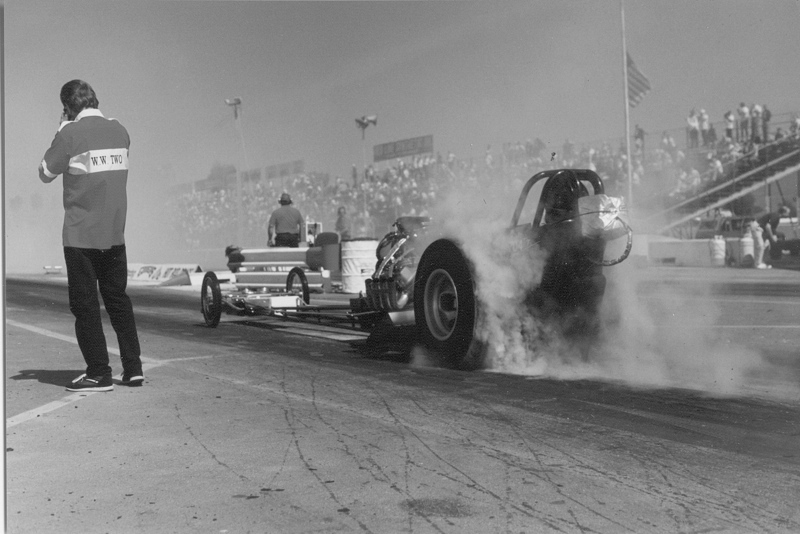 Starter Larry Sutton (of Lions Drag Strip fame and an absolute Timelord of the Xmas tree) doused the flames with a fire extinguisher and motioned Bill into the beams (! ); the blower straps caught on fire again and Sutton hit the extinguisher once more before giving Alexander the kill sign. Sutton then wheeled around and held up one finger to Murphy, signifying a solo shot to victory. It was a touching coda to one of the most emotional weekends in drag racing as crew members gathered around Murphy and the W.W. Two machine in a semi-circle, most of whom raised the right hand and the air and extended their index fingers in salute to their fallen leader. As Murphy popped the parachutes at the culmination of a 6.23, 208 victory lap, railbirds, racers and bleacher bums were openly weeping. TOP FUEL WORMHOLE is available here.